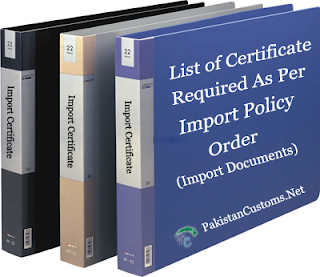 In order to facilitate trade and to expedite clearance, it is hereby advised to all concerned that different certificates required as per Import Policy Order of Pakistan for the import of certain goods into Pakistan may be uploaded with the GD at the time of filing of the GD. 0101.2100 NOC from National Council for Conservation of Wild Life (NCCW) for wild life species including those mentioned in Appendix-II of the CITES. 0101.3000 NOC from National Council for Conservation of Wild Life (NCCW) for wild life species including those mentioned in Appendix-II of the CITES. 0101.9000 NOC from National Council for Conservation of Wild Life (NCCW) for wild life species including those mentioned in Appendix-II of the CITES. 0102.2110 NOC from National Council for Conservation of Wild Life (NCCW) for wild life species including those mentioned in Appendix-II of the CITES. 0102.2120 NOC from National Council for Conservation of Wild Life (NCCW) for wild life species including those mentioned in Appendix-II of the CITES. 0102.2130 NOC from National Council for Conservation of Wild Life (NCCW) for wild life species including those mentioned in Appendix-II of the CITES. 0102.2190 NOC from National Council for Conservation of Wild Life (NCCW) for wild life species including those mentioned in Appendix-II of the CITES. 0102.2910 NOC from National Council for Conservation of Wild Life (NCCW) for wild life species including those mentioned in Appendix-II of the CITES. 0102.2920 NOC from National Council for Conservation of Wild Life (NCCW) for wild life species including those mentioned in Appendix-II of the CITES. 0102.2930 NOC from National Council for Conservation of Wild Life (NCCW) for wild life species including those mentioned in Appendix-II of the CITES. 0102.2990 NOC from National Council for Conservation of Wild Life (NCCW) for wild life species including those mentioned in Appendix-II of the CITES. 0102.3100 NOC from National Council for Conservation of Wild Life (NCCW) for wild life species including those mentioned in Appendix-II of the CITES. 0102.3900 NOC from National Council for Conservation of Wild Life (NCCW) for wild life species including those mentioned in Appendix-II of the CITES. 0102.9000 NOC from National Council for Conservation of Wild Life (NCCW) for wild life species including those mentioned in Appendix-II of the CITES. 0104.1000 NOC from National Council for Conservation of Wild Life (NCCW) for wild life species including those mentioned in Appendix-II of the CITES. 0104.2000 NOC from National Council for Conservation of Wild Life (NCCW) for wild life species including those mentioned in Appendix-II of the CITES. 0105.1100 NOC from National Council for Conservation of Wild Life (NCCW) for wild life species including those mentioned in Appendix-II of the CITES. 0105.1200 NOC from National Council for Conservation of Wild Life (NCCW) for wild life species including those mentioned in Appendix-II of the CITES. 0105.1300 NOC from National Council for Conservation of Wild Life (NCCW) for wild life species including those mentioned in Appendix-II of the CITES. 0105.1400 NOC from National Council for Conservation of Wild Life (NCCW) for wild life species including those mentioned in Appendix-II of the CITES. 0105.1500 NOC from National Council for Conservation of Wild Life (NCCW) for wild life species including those mentioned in Appendix-II of the CITES. 0105.9400 NOC from National Council for Conservation of Wild Life (NCCW) for wild life species including those mentioned in Appendix-II of the CITES. 0105.9900 NOC from National Council for Conservation of Wild Life (NCCW) for wild life species including those mentioned in Appendix-II of the CITES. 0106.1100 NOC from National Council for Conservation of Wild Life (NCCW) for wild life species including those mentioned in Appendix-II of the CITES. 0106.1200 NOC from National Council for Conservation of Wild Life (NCCW) for wild life species including those mentioned in Appendix-II of the CITES. 0106.1900 NOC from National Council for Conservation of Wild Life (NCCW) for wild life species including those mentioned in Appendix-II of the CITES. 0106.2000 NOC from National Council for Conservation of Wild Life (NCCW) for wild life species including those mentioned in Appendix-II of the CITES. 0106.3110 NOC from National Council for Conservation of Wild Life (NCCW) for wild life species including those mentioned in Appendix-II of the CITES. 0106.3190 NOC from National Council for Conservation of Wild Life (NCCW) for wild life species including those mentioned in Appendix-II of the CITES. 0106.3200 NOC from National Council for Conservation of Wild Life (NCCW) for wild life species including those mentioned in Appendix-II of the CITES. 0106.3900 NOC from National Council for Conservation of Wild Life (NCCW) for wild life species including those mentioned in Appendix-II of the CITES. 0106.9000 NOC from National Council for Conservation of Wild Life (NCCW) for wild life species including those mentioned in Appendix-II of the CITES. 0511.1000 NOC from National Council for Conservation of Wild Life (NCCW) for wild life species including those mentioned in Appendix-II of the CITES. 0511.9990 NOC from National Council for Conservation of Wild Life (NCCW) for wild life species including those mentioned in Appendix-II of the CITES. 0601.1010 Certificate from Federal Seed Certification Agency. 0601.1010 Phytosanitary certificate from Department of Plant Protection. 0601.1090 Certificate from Federal Seed Certification Agency. 0601.1090 Phytosanitary certificate from Department of Plant Protection. 0601.2000 Certificate from Federal Seed Certification Agency. 0601.2000 Phytosanitary certificate from Department of Plant Protection. 0602.1000 Certificate from Federal Seed Certification Agency. 0602.1000 Phytosanitary certificate from Department of Plant Protection. 0602.2000 Certificate from Federal Seed Certification Agency. 0602.2000 Phytosanitary certificate from Department of Plant Protection. 0602.3000 Certificate from Federal Seed Certification Agency. 0602.3000 Phytosanitary certificate from Department of Plant Protection. 0602.4000 Certificate from Federal Seed Certification Agency. 0602.4000 Phytosanitary certificate from Department of Plant Protection. 0602.9010 Certificate from Federal Seed Certification Agency. 0602.9010 Phytosanitary certificate from Department of Plant Protection. 0602.9090 Certificate from Federal Seed Certification Agency. 0602.9090 Phytosanitary certificate from Department of Plant Protection. 0603.1100 Certificate from Federal Seed Certification Agency. 0603.1200 Certificate from Federal Seed Certification Agency. 0603.1300 Certificate from Federal Seed Certification Agency. 0603.1400 Certificate from Federal Seed Certification Agency. 0603.1500 Certificate from Federal Seed Certification Agency. 0603.1900 Certificate from Federal Seed Certification Agency. 0603.9000 Certificate from Federal Seed Certification Agency. 0604.2000 Certificate from Federal Seed Certification Agency. 0604.9000 Certificate from Federal Seed Certification Agency. 0701.1000 Certificate from Department of Plant Protection. 0701.1000 Certificate from Federal Seed Certification Agency. 0801.1100 Aflatoxin Report from Department of Plant Protection. 0801.1910 Aflatoxin Report from Department of Plant Protection. 0801.1910 Certificate from Federal Seed Certification Agency. 0801.1990 Aflatoxin Report from Department of Plant Protection. 0801.2100 Aflatoxin Report from Department of Plant Protection. 0801.2200 Aflatoxin Report from Department of Plant Protection. 0801.3100 Aflatoxin Report from Department of Plant Protection. 0801.3200 Aflatoxin Report from Department of Plant Protection. 0802.1100 Aflatoxin Report from Department of Plant Protection. 0802.1200 Aflatoxin Report from Department of Plant Protection. 0802.2100 Aflatoxin Report from Department of Plant Protection. 0802.2200 Aflatoxin Report from Department of Plant Protection. 0802.3100 Aflatoxin Report from Department of Plant Protection. 0802.3200 Aflatoxin Report from Department of Plant Protection. 0802.4100 Aflatoxin Report from Department of Plant Protection. 0802.4200 Aflatoxin Report from Department of Plant Protection. 0802.5100 Aflatoxin Report from Department of Plant Protection. 0802.5200 Aflatoxin Report from Department of Plant Protection. 0802.6100 Aflatoxin Report from Department of Plant Protection. 0802.6200 Aflatoxin Report from Department of Plant Protection. 0802.7000 Aflatoxin Report from Department of Plant Protection. 0802.8000 Aflatoxin Report from Department of Plant Protection. 0802.9000 Aflatoxin Report from Department of Plant Protection. 0803.1000 Aflatoxin Report from Department of Plant Protection. 0803.9000 Aflatoxin Report from Department of Plant Protection. 0804.1010 Aflatoxin Report from Department of Plant Protection. 0804.1020 Aflatoxin report from Department of Plant Protection. 0804.2000 Aflatoxin report from Department of Plant Protection. 0804.3000 Aflatoxin report from Department of Plant Protection. 0804.4000 Aflatoxin report from Department of Plant Protection. 0804.5010 Aflatoxin report from Department of Plant Protection. 0804.5020 Aflatoxin report from Department of Plant Protection. 0804.5030 Aflatoxin report from Department of Plant Protection. 0804.5040 Aflatoxin Report from Department of Plant Protection. 0804.5050 Aflatoxin Report from Department of Plant Protection. 0804.5090 Aflatoxin Report from Department of Plant Protection. 0805.1000 Aflatoxin report from Department of Plant Protection. 0805.2010 Aflatoxin report from Department of Plant Protection. 0805.2090 Aflatoxin report from Department of Plant Protection. 0805.4000 Aflatoxin report from Department of Plant Protection. 0805.5000 Aflatoxin report from Department of Plant Protection. 0805.9000 Aflatoxin report from Department of Plant Protection. 0806.1000 Aflatoxin report from Department of Plant Protection. 0806.2000 Aflatoxin report from Department of Plant Protection. 0807.1100 Aflatoxin report from Department of Plant Protection. 0807.1900 Aflatoxin report from Department of Plant Protection. 0807.2000 Aflatoxin report from Department of Plant Protection. 0808.1000 Aflatoxin report from Department of Plant Protection. 0808.3000 Aflatoxin Report from Department of Plant Protection. 0808.4000 aflatoxin Report from Department of Plant Protection. 0809.1000 Aflatoxin report from Department of Plant Protection. 0809.2100 Aflatoxin Report from Department of Plant Protection. 0809.2900 Aflatoxin Report from Department of Plant Protection. 0809.3000 Aflatoxin report from Department of Plant Protection. 0809.4000 Aflatoxin report from Department of Plant Protection. 0810.1000 Aflatoxin report from Department of Plant Protection. 0810.2000 Aflatoxin report from Department of Plant Protection. 0810.3000 Aflatoxin report from Department of Plant Protection. 0810.4000 Aflatoxin report from Department of Plant Protection. 0810.5000 Aflatoxin report from Department of Plant Protection. 0810.6000 Aflatoxin report from Department of Plant Protection. 0810.9010 Aflatoxin report from Department of Plant Protection. 0810.9090 Aflatoxin report from Department of Plant Protection. 0811.1000 Aflatoxin report from Department of Plant Protection. 0811.2000 Aflatoxin report from Department of Plant Protection. 0811.9000 Aflatoxin report from Department of Plant Protection. 0812.1000 Aflatoxin report from Department of Plant Protection. 0812.9000 Aflatoxin report from Department of Plant Protection. 0813.1000 Aflatoxin report from Department of Plant Protection. 0813.2000 Aflatoxin report from Department of Plant Protection. 0813.3000 Aflatoxin report from Department of Plant Protection. 0813.4010 Aflatoxin report from Department of Plant Protection. 0813.4020 Aflatoxin report from Department of Plant Protection. 0813.4030 Aflatoxin Report from Department of Plant Protection. 0813.4040 Aflatoxin Report from Department of Plant Protection. 0813.4050 Aflatoxin Report from Department of Plant Protection. 0813.4060 Aflatoxin Report from Department of Plant Protection. 0813.4070 Aflatoxin Report from Department of Plant Protection. 0813.4090 Aflatoxin report from Department of Plant Protection. 0813.5000 Aflatoxin report from Department of Plant Protection. 0814.0000 Aflatoxin report from Department of Plant Protection. 0904.1130 Certificate from Federal Seed Certification Agency. 0904.2110 Aflatoxin report from Department of Plant Protection. 0904.2120 Certificate from Federal Seed Certification Agency. 0907.0000 Certificate from Department of Plant Protection. 0908.1100 Certificate from Federal Seed Certification Agency. 0908.1200 Certificate from Federal Seed Certification Agency. 0908.2100 Certificate from Federal Seed Certification Agency. 0908.2200 Certificate from Federal Seed Certification Agency. 0908.3110 Certificate from Federal Seed Certification Agency. 0908.3120 Certificate from Federal Seed Certification Agency. 0908.3200 Certificate from Federal Seed Certification Agency. 0909.2100 Certificate from Federal Seed Certification Agency. 0909.2200 Certificate from Federal Seed Certification Agency. 0909.3100 Certificate from Federal Seed Certification Agency. 0909.3200 Certificate from Federal Seed Certification Agency. 0909.6100 Certificate from Federal Seed Certification Agency. 0909.6200 Certificate from Federal Seed Certification Agency. 0910.1100 Certificate from Federal Seed Certification Agency. 0910.1200 Certificate from Federal Seed Certification Agency. 0910.2000 Certificate from Federal Seed Certification Agency. 0910.3000 Certificate from Federal Seed Certification Agency. 0910.3000 Certificate from Department of Plant Protection. 1001.1100 Certificate from Department of Plant Protection. 1001.1100 Certificate from Federal Seed Certification Agency. 1001.1900 Certificate from Department of Plant Protection. 1001.1900 Certificate from Federal Seed Certification Agency. 1001.9100 Certificate from Department of Plant Protection. 1001.9100 Certificate from Federal Seed Certification Agency. 1001.9900 Certificate from Department of Plant Protection. 1001.9900 Certificate from Federal Seed Certification Agency. 1002.1000 Certificate from Federal Seed Certification Agency. 1002.9000 Certificate from Federal Seed Certification Agency. 1003.1000 Certificate from Federal Seed Certification Agency. 1003.9000 Certificate from Federal Seed Certification Agency. 1004.1000 Certificate from Federal Seed Certification Agency. 1004.9000 Certificate from Federal Seed Certification Agency. 1005.1000 Certificate from Federal Seed Certification Agency. 1005.9000 Certificate from Federal Seed Certification Agency. 1006.1010 Certificate from Federal Seed Certification Agency. 1006.1090 Certificate from Federal Seed Certification Agency. 1007.1000 Certificate from Federal Seed Certification Agency. 1007.9000 Certificate from Federal Seed Certification Agency. 1008.1000 Certificate from Federal Seed Certification Agency. 1008.2100 Certificate from Federal Seed Certification Agency. 1008.2900 Certificate from Federal Seed Certification Agency. 1008.3000 Certificate from Federal Seed Certification Agency. 1008.4000 Certificate from Federal Seed Certification Agency. 1008.5000 Certificate from Federal Seed Certification Agency. 1008.6000 Certificate from Federal Seed Certification Agency. 1008.9000 Certificate from Federal Seed Certification Agency. 1104.2900 Certificate from Federal Seed Certification Agency. 1108.1200 Certificate from Federal Seed Certification Agency. 1201.1000 Certificate from Federal Seed Certification Agency. 1201.9000 Certificate from Federal Seed Certification Agency. 1202.1000 Certificate from Department of Plant Protection. 1202.1000 Certificate from Federal Seed Certification Agency. 1202.3000 Certificate from Federal Seed Certification Agency. 1202.4100 Certificate from Federal Seed Certification Agency. 1202.4200 Certificate from Federal Seed Certification Agency. 1203.0000 Certificate from Federal Seed Certification Agency. 1204.0000 Certificate from Federal Seed Certification Agency. 1204.0000 Certificate from Department of Plant Protection. 1205.1000 Certificate from Federal Seed Certification Agency. 1205.1000 Certificate from Department of Plant Protection. 1207.1000 Certificate from Federal Seed Certification Agency. 1207.1000 Certificate from Department of Plant Protection. 1207.2000 Certificate from Ministry of Food, Agriculture and Livestock. 1207.2100 Certificate from Federal Seed Certification Agency. 1207.2100 Certificate from Department of Plant Protection. 1207.2900 Certificate from Federal Seed Certification Agency. 1207.2900 Certificate from Department of Plant Protection. 1207.3000 Certificate from Federal Seed Certification Agency. 1207.3000 Certificate from Department of Plant Protection. 1207.6000 Certificate from Federal Seed Certification Agency. 1207.6000 Certificate from Department of Plant Protection. 1207.7000 Certificate from Federal Seed Certification Agency. 1207.9900 Certificate from Federal Seed Certification Agency. 1207.9900 Certificate from Department of Plant Protection. 1208.1000 Certificate from Federal Seed Certification Agency. 1208.9020 Certificate from Federal Seed Certification Agency. 1208.9020 Certificate from Department of Plant Protection. 1208.9090 Certificate from Federal Seed Certification Agency. 1208.9090 Certificate from Department of Plant Protection. 1209.1000 Certificate from Federal Seed Certification Agency. 1209.1000 Certificate from Department of Plant Protection. 1209.2100 Certificate from Federal Seed Certification Agency. 1209.2100 Certificate from Department of Plant Protection. 1209.2200 Certificate from Federal Seed Certification Agency. 1209.2200 Certificate from Department of Plant Protection. 1209.2300 Certificate from Federal Seed Certification Agency. 1209.2300 Certificate from Department of Plant Protection. 1209.2400 Certificate from Federal Seed Certification Agency. 1209.2400 Certificate from Department of Plant Protection. 1209.2500 Certificate from Federal Seed Certification Agency. 1209.2500 Certificate from Department of Plant Protection. 1209.2900 Certificate from Federal Seed Certification Agency. 1209.2900 Certificate from Department of Plant Protection. 1209.3000 Certificate from Federal Seed Certification Agency. 1209.3000 Certificate from Department of Plant Protection. 1209.9110 Certificate from Federal Seed Certification Agency. 1209.9110 Certificate from Department of Plant Protection . 1209.9120 Certificate from Federal Seed Certification Agency. 1209.9120 Certificate from Department of Plant Protection . 1209.9130 Certificate from Federal Seed Certification Agency. 1209.9130 Certificate from Department of Plant Protection . 1209.9190 Certificate from Federal Seed Certification Agency. 1209.9190 Certificate from Department of Plant Protection . 1209.9900 Certificate from Federal Seed Certification Agency. 1209.9900 Certificate from Department of Plant Protection. 1210.1000 Certificate from Federal Seed Certification Agency. 1210.1000 Certificate from Department of Plant Protection. 1210.2000 Certificate from Department of Plant Protection. 1211.2000 Certificate from Department of Plant Protection. 1211.3000 Certificate from Federal Seed Certification Agency. 1211.3000 Certificate from Department of Plant Protection. 1211.4000 Certificate from Federal Seed Certification Agency. 1211.4000 Certificate from Department of Plant Protection. 1211.9000 Certificate from Department of Plant Protection. 1212.2100 Certificate from Department of Plant Protection. 1212.2900 Certificate from Department of Plant Protection. 1212.9100 Certificate from Department of Plant Protection. 1212.9200 Certificate from Federal Seed Certification Agency. 1212.9200 Certificate from Department of Plant Protection. 1212.9300 Certificate from Federal Seed Certification Agency. 1212.9300 Certificate from Department of Plant Protection. 1212.9400 Certificate from Federal Seed Certification Agency. 1212.9400 Certificate from Department of Plant Protection. 1212.9900 Certificate from Federal Seed Certification Agency. 1212.9900 Certificate from Department of Plant Protection. 1213.0000 Certificate from Department of Plant Protection. 1214.1000 Certificate from Department of Plant Protection. 1214.9000 Certificate from Department of Plant Protection. 1301.9020 Certificate from Federal Seed Certification Agency. 1301.9020 Certificate from Department of Plant Protection. 1301.9090 Certificate from Federal Seed Certification Agency. 1401.1000 Certificate from Department of Plant Protection. 1401.2000 Certificate from Department of Plant Protection. 1401.9000 Certificate from Department of Plant Protection. 1404.2000 Certificate from Department of Plant Protection. 1404.9010 Certificate from Department of Plant Protection. 1404.9020 Certificate from Department of Plant Protection. 1404.9030 Certificate from Department of Plant Protection. 1404.9041 Certificate from Department of Plant Protection. 1404.9049 Certificate from Department of Plant Protection. 1511.1000 importable by manufacturers having valid license and registration from PSQCA for further processing and refining. 2620.1100 Certification from the relevant government agency of the exporting country that scrap being exported does not contain hazardous waste and comply with the provision of Basel Convention. 2620.1900 Certification from the relevant government agency of the exporting country that scrap being exported does not contain hazardous waste and comply with the provision of Basel Convention. 2620.2100 Certification from the relevant government agency of the exporting country that scrap being exported does not contain hazardous waste and comply with the provision of Basel Convention. 2621.0000 Certification from the relevant government agency of the exporting country that scrap being exported does not contain hazardous waste and comply with the provision of Basel Convention. 2903.3910 Import only for Quarantine and Pre shipment purposes with the permission of Plant Protection Department karachi, Ministry of National Food Security & Research. 2903.7790 BL wise certificate of Import from the Ministry of Climate Change. 2903.7790 Permission from Ministry of Commerce through Ozone Cell. BL wise certificate from Ministry of Environmrnt.